Mobile vs Online. And how many accounts can you have? Which is best, online or mobile? And how many bank accounts can I open at once? There’s nothing to stop you opening more than one bank account. Providing you’re not trying to open several in a short space of time, you can run as many as you like; that’s with or without funds, as an everyday or occasional, largely dormant, online, app-based or branch-only. It’s becoming increasingly popular too, with well over a quarter of us now running more than one account, for all sorts of reasons. What’s the difference between online and app-based banking? Online banking refers to banking done on the internet, typically via a personal computer. You log in to your account through your bank’s website using personal info and a password. Once in, you see your balances and transactions, your history and maybe an offer of a loan or savings account. You can make payments, pay bills or transfer money between your accounts. You can do almost any activity online that you would be able to do when visiting a branch and, thanks to its convenience, its popularity continues to grow. Banks all over the world offer this service and 71% of UK adults now use some form of online banking. What online banking started, mobile banking continued. As the advent of mobile and smartphone technology evolved banking once again, users who had been using online banking began to use mobile banking, too. This shift reflected the trend in wider society, as many of life’s functions - from shopping, to entertainment, to dating - were now accessed via our phones. Until 2010, mobile banking was largely conducted via SMS, as users were sent balances and confirmations to their phones. But smartphone technology allowed banks to either offer optimised online portals or, increasingly, branded, personalised apps that were installed on users’ phones. 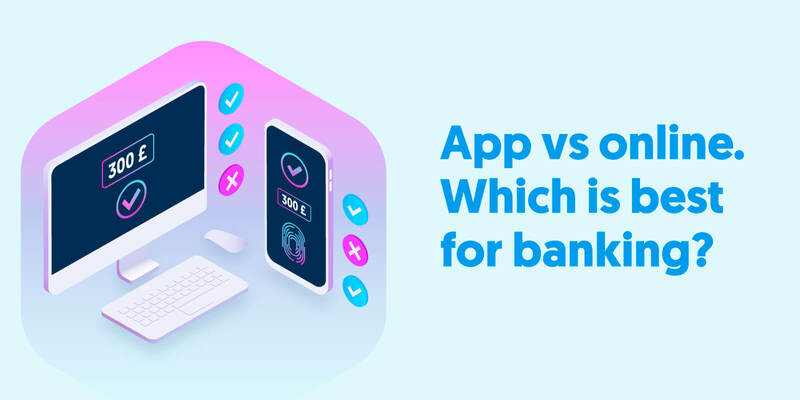 It’s estimated that around 4 in 10 people in the UK regularly use mobile banking apps, with all major retail banks providing mobile banking offerings, mainly via apps. Mobile banking apps offer you a wide range of services that include balance and transaction histories, the ability to pay bills and transfer money, locate ATMs, make mobile top ups, and apply for loans and credit cards. That functionality is only set to increase over time as app and smartphone technology improves even further. Which is better, online or app? That will depend on you. Let’s have a look at the benefits in more detail. Online banking allows a user to see real time, up to date information about their account. There is no delay and you no longer have to walk to a bank or an ATM to see your balance. You just login and see your details online. banking lets users view their account information from anywhere in the world. All they need is a computer and an internet connection. banking portals are becoming increasingly sophisticated, with functionality and tools being added so users can, for example, analyse their spending habits and make savings goals. Online banking has been susceptible to internet fraud and hacking due to rich browser functionality and less-controlled desktop operating systems. Such issues are improving online experience but still it isn’t nearly as secure as mobile banking. is the case with all secure portal, in order to login to your account, you need to remember complex details. This could slow you down if you need to make urgent bank transfers. online banking relies on the speed of your internet connection, it can be hampered by slow connection speeds that are sometimes associated with desktop and personal computers. This can also slow down the process of transferring money and making payments, if not cut them off entirely if you lose connection during the process. Our smartphones are always on us. So accessing mobile banking apps is easy as when you want to log in, you just pull your phone out of your pocket. nature of apps mean that banks can add an increasing number of tools and functions to their existing products. All a user needs to do is download the latest version of the app and they get the improved functionality direct to their phone. banking is not bulletproof but when compared to online banking, mobile banking is more secure as the app exists on a highly secure mobile phone. Increased biometric security functionality is improving security further. You should always be careful with your mobile phone. If it’s stolen, your banking apps might be hacked. Always make sure you contact your bank as soon as possible to block your app or card. If you lose your card, however, some mobile banks allow you to freeze and unfreeze your card from the app - which gives you time to find it. are inherently stable, but when your bank has problems it might affect an app’s performance. This could mean that you can’t access the app and your account information whilst it is fixed. Given the increasing security, functionality and accessibility that mobile technology offers, online banking, not to mention high street bank branches, maybe under threat as more users switch to mobile banking. Why is it a good idea to have more than one account? You may be offered interest with a current account. may be given cash or loyalty bonuses just for switching your bills or salary to a new account - or even just to open a new account might like to use different banks to see which products, services and features you like such as budget tools government guarantees to safeguard your first £85,000 in a UK bank account (strictly speaking per financial institution) so you may want to have a second account to spread your risk around. Crucially, the introduction of Open Banking, as a part of PSD2, is giving users more options and access to financial services via the Internet, including giving the ability to compare products from a range of banks and find products that are more suited to their specific needs. Over the last decade, we’ve seen a huge rise in the number of mobile-only banks and financial services companies. The banks of the future will be mobile-only. Given the huge change we’ve seen in online and mobile banking over the last decade, it will be fascinating to see what the next stage of development brings. Technologies like biometrics and blockchain are fast becoming a real and useful part of the banking world, helping to provide solutions that will improve offerings even further.